Find cheap haircuts and discount salon offers. Whether your try to keep your hair at the same length at all times, you want to cover up some gray hair or you'd like a bit of wave in your mane, chances are strong that you need to visit a salon or barber shop a few times a year, and all of those visits to can add up and put quite a dent in your budget. But to ensure you can save cash on these services, always look for deals, coupons and promos to make sure you can find cheap haircuts and other beauty services. 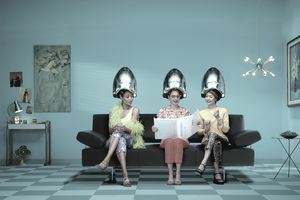 Keep in mind: to save the maximum on salon services, you may need to switch up your beauty routine. If you’re accustomed to visiting the same barber or cosmetologist every few weeks, saving money might require you to switch to another venue that offers more discounts and deals. If you aren’t willing to switch salons, you might share with your cosmetologist that you can’t afford the cuts and ask if any discounts are available, or whether your salon accepts competitors' coupons or deals. Check out the following national chains that offer deals and discounts on your beauty services so you can start saving the next time you need a trim or color. Supercuts has locations across the US, most of which participate in the company’s Coupons program. The deals will vary based on which location you plan to visit, but one nationwide deal that is usually available is the offer to get $2.00 off your next salon visit if you sign up for the company’s email list. In addition to the initial offer, you’ll receive occasional emails with additional deals, coupon codes and offers. In addition, other sites sometimes provide deals for Supercuts. For instance, Groupon will occasionally offer pre-paid haircuts for half the price of a standard one. This national chain usually locates its salons inside of its retail locations, which sell cosmetics, beauty products, perfume and hair items. You can find a wide variety of services at the salon, from highlights to beard trims to Brazilian blowouts. New salon customers can get 25 percent off their first hair or skin service, based on the deals currently available on the company’s website. The company is also offering 15 percent off of keratin treatments as part of its summer offers, but these deals can change frequently, so visit the website or call your nearest location for more details. In addition, it’s a good idea to check Ulta’s weekly circular in your Sunday newspaper or online so you can benefit from the latest news on salon deals and steals. Another national chain found across the country, Great Clips offers discounted hair cuts and other services, often with promotions that will save you even more than the standard low rates. Your local Great Clips usually advertises the discounts it’s offering via posters and window signs. In addition, you can find the national deals on the company’s Promotions page. If you download the Great Clips app on your phone or tablet, you can also register for the firm’s promotions to be sent directly to your email inbox so you are among the first to hear about discounts. With locations in 37 states, most people are near one of the 600 Cost Cutters locations, where you can get a variety of beauty services in addition to haircuts (such as waxing, highlights, perms and deep conditioning treatments). To save on your next service, you can sign up for the company’s email service and get $2.00 off of your next visit. Once you’re part of the email group, you’ll be among the first to get discounts and deals on future promotions so you can potentially schedule your upcoming haircuts around when the most lucrative deals are offered. This national chain is known for entertaining men by allowing them to watch sports on television while they get their hair cut, experience a hot towel wrap and enjoy a relaxing neck and shoulder treatment. Other services include neck trims and beard detailing. The male-focused stores often offer local deals on a store-by-store basis, but it also provides discounts to members of its email club. You can also get special deals on your birthday by signing up for the birthday club at your local SportClips franchise.